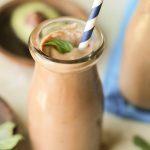 A thick and creamy keto chocolate shake to satisfy even the worst sweet tooth with no blood sugar spikes!! 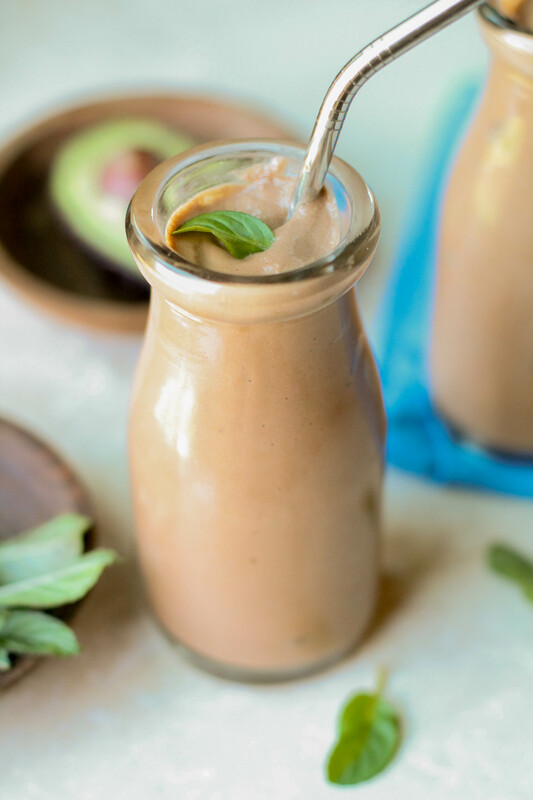 Loaded with good-for-you ingredients, this keto smoothie is a balanced meal OR a treat, and no one will ever guess the sneaky vegetable hidden inside! As the weather turns warm, my body finally starts craving cool smoothies and shakes! I’m grateful, as smoothies are SO quick to throw together, and can be loaded with so many good-for-ingredients. While I prefer to chew my food most of the time, smoothies are the ultimate grab and go nourishing meal! Since my son is still OOBER picky (sigh), I have to be a smoothie ninja….creating healthy and balanced smoothies that he will consume….but that also don’t fill him with a massive dose of sugar. My game has to be STRONG!! For two years now, I have been very conscientious of my sugar intake…even fruit sugars. Years of stress and a carb dominate diet left me with some unstable blood sugars bordering on pre-diabetic and an inability to lose weight no matter WHAT I did (you can read about all my struggles in this series). So I turned to a keto-style diet that finally turned things around for me. I learned that while a serving of fruit or two (or three!) a day is totally possible in a a healthy diet….pounds of fruit in one meal just isn’t a good idea for anyone. Most people wouldn’t sit down and consume 6 servings of fruit in one sitting…so blending that quantity doesn’t make much health sense either. Way too big of an insulin spike. So I had to learn how to make my favorite smoothies, and all my new ones with minimal fruit. 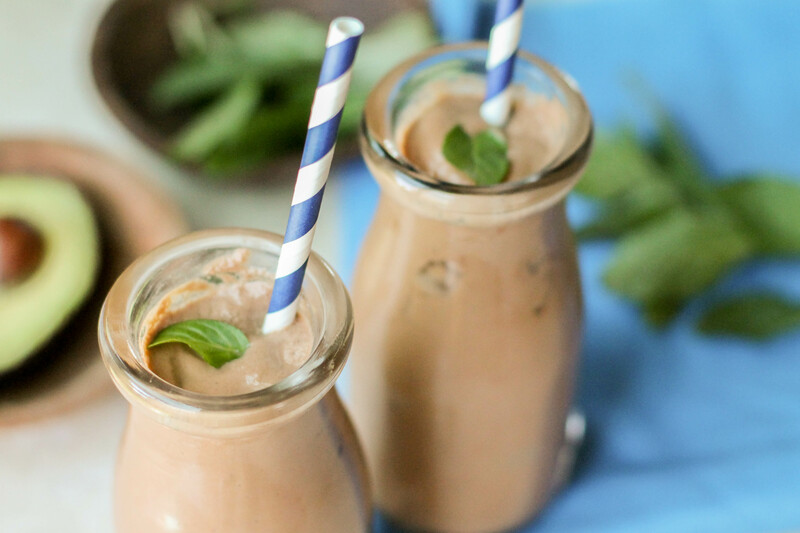 This creamy keto milkshake doesn’t contain ANY! I sometimes add a handful of wild blueberries or strawberries to my son’s version (sans mint!). Collagen – With all the amino acids and good protein, this gut healing supplement is part of our daily repertoire. I have started using this brand exclusively now! My son is sensitive to glyphosate residue, and many grass fed sources come from Argentina where there is a lot of that used. Perfect Supplements tests theirs to be sure it is pure! You can use the code “tessa10” to get 10% off your order! Probiotics – We have a habit of cycling through lots of brands to keep a variety in our guts! Greens powder – Here is another add in that is virtually tasteless i small quantities, and super good for our bodies! Cleansing, detoxing, anemia support….this is a great supplement to sneak in wherever you can!! Again, use “tessa10” to get 10% off. Acacia Fiber – I love to add this fiber to my smoothies for healthy digestion and staying power! It’s non-thickening, so it’s perfect for smoothies and baking! 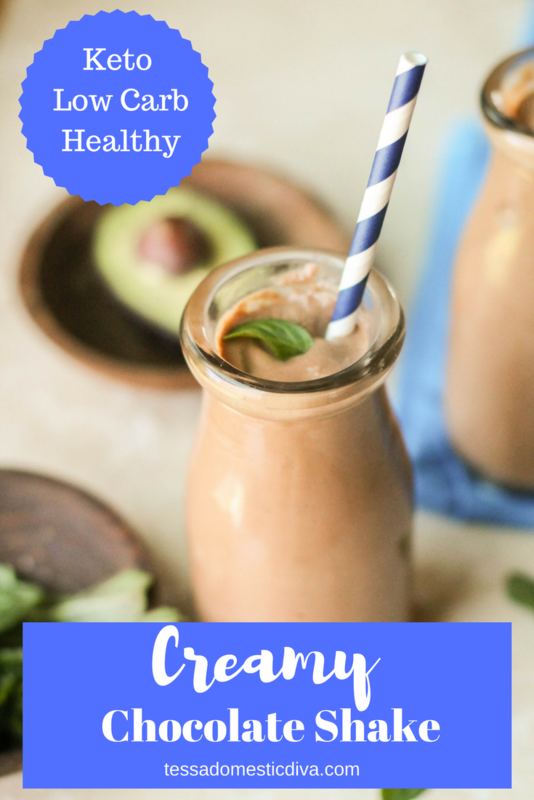 Place all ingredients into a high powered blender and whir until smooth and creamy! *only use therapeutic grade essential oils for ingestion! You can buy a safe brand here. I’d love to have chocolate shake right now, too!! So delicious! Oh – this sounds so good! I have to watch my blood sugar, too, so this is right up my alley. I just made this double the recipe and a package of cream cheese instead of the avocado since I was really craving cheesecake. It is fabulous! I’ll try the avocado another time as I’m sure it’s delicious that way as well. Thank you! Great idea on the cream cheese Maria, thanks for your feedback!!! It always makes my day! This looks so good! I love that you packed it with cauliflower and avocado! I can’t wait to make this for my husband and youngest. That looks so creamy and delicious! Yum! Wow, so creamy and delicious! I want one! This is so awesome! Finally a shake without banana! Wohoo! I’ve been putting frozen cauliflower in my smoothies instead of banana and love it. I also do frozen zucchini. This looks delish! Yummy Chocolate Goodness! Craving chocolate so this is perfect! I love that you added avocado to this smoothie. What a great way to incorporate healthy fats! Looks so creamy and delicious. Hey Cass! I have started using frozen riced cauliflower in my smoothies….it disappears SO easily to in to loads of flavors, doesn’t change the color which my kids shy away from, and raw brassicas are great for your health! Seriously, try it!! Just make sure it is not the super odoriferous kind that is starting to go out…I am sure you know what I mean!! This looks delicious Tessa! Have you ever tried intermittent fasting? That worked wonders for me for losing baby weight! Lauren, I fast daily from 6ish to 12ish the next day, give or take! Delicious and looks simple too! Anything chocolate has my vote!